2003-12-16 Assigned to ADVANCED CARDIOVASCULAR SYSTEMS, INC. reassignment ADVANCED CARDIOVASCULAR SYSTEMS, INC. ASSIGNMENT OF ASSIGNORS INTEREST (SEE DOCUMENT FOR DETAILS). Assignors: PACETTI, STEPHEN D., DESNOYER, JESSICA R.
The drug-polymer layer can be applied directly onto at least a part of the stent surface to serve as a reservoir for at least one active agent or a drug which is incorporated into the reservoir layer. The primer layer can be applied between the stent and the reservoir to improve the adhesion of the drug-polymer layer to the stent. The topcoat layer can be applied over at least a portion of the reservoir layer and serves as a rate limiting membrane which helps to control the rate of release of the drug. In one embodiment, the topcoat layer can be essentially free from any active agents or drugs. If the topcoat layer is used, the optional finishing coat layer can be applied over at least a portion of the topcoat layer for further control of the drug release rate and for improving the biocompatibility of the coating, for example, for providing the surface of the coating with anti-thrombotic and/or non-fouling properties. Without the topcoat layer, the finishing coat layer can be deposited directly on the reservoir layer. In addition to amino acids listed in Table 2, alternatively other amino acids can be for example, proline (2-pyrrolidine carboxylic acid). Examples of therapeutic substances that can be used include antiproliferative substances such as actinomycin D, or derivatives and analogs thereof (manufactured by Sigma-Aldrich of Milwaukee, Wis., or COSMEGEN available from Merck). Synonyms of actinomycin D include dactinomycin, actinomycin IV, actinomycin I1, actinomycin X1, and actinomycin C1. The active agent can also fall under the genus of antineoplastic, anti-inflammatory, antiplatelet, anticoagulant, antifibrin, antithrombin, antimitotic, antibiotic, antiallergic and antioxidant substances. Examples of such antineoplastics and/or antimitotics include paclitaxel (e.g. TAXOL® by Bristol-Myers Squibb Co., Stamford, Conn.), docetaxel (e.g. Taxotere®, from Aventis S.A., Frankfurt, Germany) methotrexate, azathioprine, vincristine, vinblastine, fluorouracil, doxorubicin hydrochloride (e.g. Adriamycin® from Pharmacia & Upjohn, Peapack N.J.), and mitomycin (e.g. Mutamycin® from Bristol-Myers Squibb Co., Stamford, Conn.). Examples of such antiplatelets, anticoagulants, antifibrin, and antithrombins include sodium heparin, low molecular weight heparins, heparinoids, hirudin, argatroban, forskolin, vapiprost, prostacyclin and prostacyclin analogues, dextran, D-phe-pro-arg-chloromethylketone (synthetic antithrombin), dipyridamole, glycoprotein IIb/IIIa platelet membrane receptor antagonist antibody, recombinant hirudin, and thrombin inhibitors such as ANGIOMAX (Biogen, Inc., Cambridge, Mass.). Examples of such cytostatic or antiproliferative agents include angiopeptin, angiotensin converting enzyme inhibitors such as captopril (e.g. Capoten® and Capozide® from Bristol-Myers Squibb Co., Stamford, Conn.), cilazapril or lisinopril (e.g. Prinivil® and Prinzide® from Merck & Co., Inc., Whitehouse Station, N.J.); calcium channel blockers (such as nifedipine), colchicine, fibroblast growth factor (FGF) antagonists, fish oil (omega 3-fatty acid), histamine antagonists, lovastatin (an inhibitor of HMG-CoA reductase, a cholesterol lowering drug, brand name Mevacor® from Merck & Co., Inc., Whitehouse Station, N.J.), monoclonal antibodies (such as those specific for Platelet-Derived Growth Factor (PDGF) receptors), nitroprusside, phosphodiesterase inhibitors, prostaglandin inhibitors, suramin, serotonin blockers, steroids, thioprotease inhibitors, triazolopyrimidine (a PDGF antagonist), and nitric oxide. An example of an antiallergic agent is permirolast potassium. Other therapeutic substances or agents which may be appropriate include alpha-interferon, genetically engineered epithelial cells, tacrolimus, dexamethasone, and rapamycin and structural derivatives or functional analogs thereof, such as 40-O-(2-hydroxy)ethyl-rapamycin (known by the trade name of EVEROLIMUS available from Novartis), 40-O-(3-hydroxy)propyl-rapamycin, 40-O-[2-(2-hydroxy)ethoxy]ethyl-rapamycin, and 40-O-tetrazole-rapamycin. The coatings and methods of the present invention have been described with reference to a stent, such as a balloon expandable or self-expandable stent. The use of the coating is not limited to stents, however, and the coating can also be used with a variety of other medical devices. Examples of the implantable medical device, that can be used in conjunction with the embodiments of this invention include stent-grafts, grafts (e.g., aortic grafts), artificial heart valves, cerebrospinal fluid shunts, pacemaker electrodes, axius coronary shunts and endocardial leads (e.g., FINELINE and ENDOTAK, available from Guidant Corporation). The underlying structure of the device can be of virtually any design. The device can be made of a metallic material or an alloy such as, but not limited to, cobalt-chromium alloys (e.g., ELGILOY), stainless steel (316L), “MP35N,” “MP20N,” ELASTINITE (Nitinol), tantalum, tantalum-based alloys, nickel-titanium alloy, platinum, platinum-based alloys such as, e.g., platinum-iridium alloy, iridium, gold, magnesium, titanium, titanium-based alloys, zirconium-based alloys, or combinations thereof. Devices made from bioabsorbable or biostable polymers can also be used with the embodiments of the present invention. In some embodiments, the device, e.g., the stent, can be made from the copolymers of the invention. The synthesis of copolymer (X) can be carried out according to the following procedure. About 86.4 g (0.15 mole) of the di-p-toluenesulphonic acid salt of bis-(L-alanine)-1,4-butylene diester can be mixed with about 72 ml dry DMAC and can be reacted with about 58.2 g (0.15 mole) of di-p-nitrophenyl adipate. The reagents can be combined in a one liter round bottom flask equipped with a mechanical stirrer, a nitrogen inlet and a heated oil bath, at room temperature. 1. A medical article comprising an implantable substrate having a coating, the coating including a polymeric product of a reaction between a diol-diamine and a dicarboxylic acid. 2. The medical article of claim 1, wherein the implantable substrate is a stent. 3. The medical article of claim 1, wherein the diol-diamine is a product of condensation of an amino acid and a diol. 4. The medical article of claim 3, wherein the amino acid comprises a substance having the formula H2N—CHR—COOH, wherein R is selected from a group consisting of hydrogen, methyl, iso-propyl, sec-butyl, iso-butyl, benzyl, methyl mercaptoethyl, methylene amide, and ethylene amide. 5. The medical article of claim 3, wherein the amino acid is selected from a group consisting of glycine, alanine, valine, isoleucine, leucine, phenyl alanine, methionine, asparagine, glutamine, proline, and mixtures thereof. 6. The medical article of claim 3, wherein the diol comprises a substance having the formula HO—(CH2)x—OH, wherein x is an integer having a value between 2 and 16. 7. The medical article of claim 3, wherein the diol is selected from a group consisting of ethylene glycol, 1,2-propanediol, 1,3-propanediol, 1,4-butane diol, 1,5-pentanediol, 1,6-hexanediol, 1,7-heptanediol, 1,8-octanediol, 1,9-nonanediol, 1,10-decanediol, 1,11-undecanediol, and 1,12-dodecanediol, and mixtures thereof. 8. The medical article of claim 1, wherein the dicarboxylic acid comprises a substance having the formula HOOC—(CH2)y—COOH, wherein y is an integer having a value between 0 and 16. 9. The medical article of claim 1, wherein the dicarboxylic acid is selected from a group consisting of oxalic acid, malonic acid, succinic acid, glutaric acid, adipic acid, pimelic acid, suberic acid, azelaic acid, sebacic acid, undecanedioic acid, dodecanedioic acid, brassylic acid, tetradecanedioic acid, pentadecanedioic acid, thapsic acid, and mixtures thereof. (b) forming a coating comprising the copolymer on at least a portion of an implantable substrate, the synthesizing of the copolymer including reacting a diol-diamine with a dicarboxylic acid. 13. The method of claim 12, wherein the implantable substrate is a stent. 14. 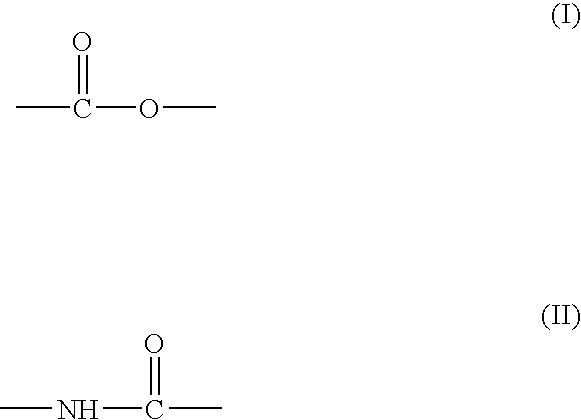 The method of claim 12, wherein the diol-diamine is a product of condensation of an amino acid and a diol. 15. The method of claim 14, wherein the amino acid wherein the amino acid comprises a substance having the formula H2N—CHR—COOH, wherein R is selected from a group consisting of hydrogen, methyl, iso-propyl, sec-butyl, iso-butyl, benzyl, methyl mercaptoethyl, methylene amide, and ethylene amide. 16. The method of claim 14, wherein the amino acid is selected from a group consisting of glycine, alanine, valine, isoleucine, leucine, phenyl alanine, methionine, asparagine, glutamine, proline, and mixtures thereof. 17. The method of claim 14, wherein the diol comprises a substance having the formula HO—(CH2)x—OH, wherein x is an integer having a value between 2 and 16. 18. The method of claim 12, wherein the dicarboxylic acid comprises a substance having the formula HOOC—(CH2)y—COOH, wherein y is an integer having a value between 0 and 16. 19. The method of claim 12, wherein the dicarboxylic acid is selected from a group consisting of oxalic acid, malonic acid, succinic acid, glutaric acid, adipic acid, pimelic acid, suberic acid, azelaic acid, sebacic acid, undecanedioic acid, dodecanedioic acid, brassylic acid, tetradecanedioic acid, pentadecanedioic acid, thapsic acid, and mixtures thereof. 21. The method of claim 20, wherein the implantable substrate is a stent. ES04813290T ES2297530T3 (en) 2003-12-16 2004-12-07 Biologically absorbable implantable devices based on polyester amides and methods of making the same coatings.